Most orders ship within 24 hours of receipt. Standard shipping is via major US carrier ground and generally arrives in 1-5 business days. Items with extended delivery are noted on the product page. Oversized or Special Shipping items: Some of the items on our site carry an additional per-item shipping charge ranging from $9.95 to $34.95. For these items, the individual product pages will indicate that special shipping charges apply, and the actual shipping charge(s) will be applied at checkout. Orders over $50 qualify for free shipping when you apply the shipping code FREESHIP. 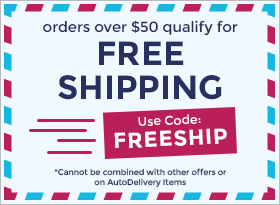 This free shipping coupon code cannot be combined with other offers or on AutoDelivery items, such as our Dry Direct program. Address correction that are able to be made after your order ships will result in an additional fee and will vary by supplier. Oversized items are indicated as such in the product description (on the product page). Parentgiving is only able to ship to the contiguous 48 US states; we do NOT offer shipping to Alaska, Hawaii, or any international destinations due to issues with Customs and excessive shipping costs.